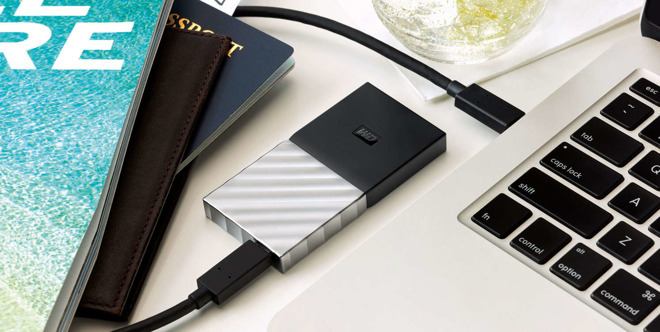 Western Digital on Thursday announced the My Passport SSD, not only its first portable SSD but a unit designed with Apple's latest MacBooks in mind, thanks to a built-in USB-C port. The drive in fact requires a bundled Type-A adapter to work with traditional USB. When connected to either USB-C or USB 3.x, it can hit speeds of up to 515 megabytes per second —it's not Thunderbolt 3-compatible, however. For basic file transfers the drive should be ready out of the box. Proprietary backup software is included, and it can also be reformatted for macOS's Time Machine. Through a WD Security app the drive can be locked with 256-bit AES encryption. Design-wise the drive is said to fit in the palm of the hand, but be engineered to survive drops up to 6.5 feet. 256 gigabyte, 512 gigabyte, and 1 terabyte models are planned, with prices around $100, $200, and $400, respectively. A launch date has yet to be revealed. USB-C is the only USB format natively supported by current MacBook and MacBook Pro models. Apple has yet to bring the technology to other Macs, though iMacs shipping this year will likely include it, as should future Mac minis, and a redesigned Mac Pro coming in 2018.